With open ended cable socks you can create a connection between two cables, or link a single cable into an unbroken loop. Part of our light to medium duty family of socks, it can be ordered in a multitude of variants from our site. 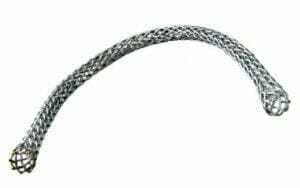 This type of wire rope sock is often used when replacing existing cables or carrying out repairs. It offers a sturdy lattice design, with breaking strength reaching 7.11 tonnes in the largest double weave example for total lifting safety. When you order you can choose between either stainless steel or galvanized steel, depending on whether strength or corrosion resistance is more important. You can fire off an email to our sales specialized via our website, or give them a call on 01384 78004. This is the best way to get product info and quick quotes for wire rope assemblies of all types. Open Ended Cable Socks Overall rating: 5 out of 5 based on 6 reviews.